Making your car look its best is easy, if you have the right tools. The key is knowing what to bring out with the wash bucket. “Getting a great-looking car doesn’t take a lot of time. You just need to follow some simple steps,” said Richard Stewart Gainer, senior test technician at Black Coral and Black Magic. Use a terrycloth, microfiber towel or sponge made specifically for vehicles. This will help prevent scratching. Rinsing with a heavy spray tends to leave behind large droplets. Also, left-over suds can cause spotting. A tire brush removes the browning that causes tires to look dull. Apply a tire dressing to compliment the luster of painted surfaces. Dark-colored vehicles show dust accumulation quickly. Apply a spray wax detailer every two or three weeks and a carnauba-based wax every three months. 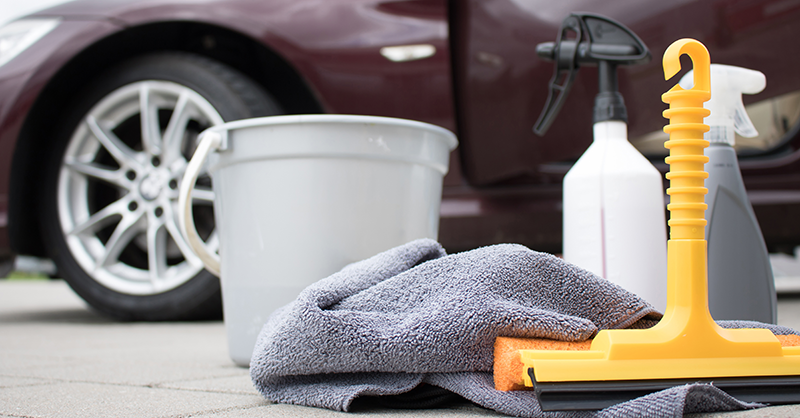 Apply a carnauba-based wax every three months to protect painted surfaces. Silicon-based products tend to create a smeared appearance on black or dark-colored vehicles. Avoid harsh solvents such as detergents. Dish soap or household cleaners can permanently damage paint and rubber surfaces. Use separate tools for separate tasks. The tool wiping brake dust off your wheels shouldn’t also be used on the upholstery or dashboard.